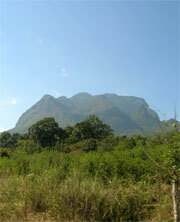 Chiang Dao, the last tooth of the Himalayas rises majestically above the rest of the mountains. 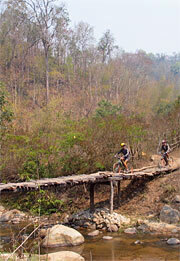 In its shadow we find some of the most remote and interesting rides in Northern Thailand. This ride includes an awesome 4 X wheel drive tour up to a 5800 foot mountain at the famous Doi Chiang Dao "The last tooth of the Himalayas". From the summit we depart by mountain bikes along the ridge with beautiful views across to Chiang Dao and into the Mae Taeng Valley. 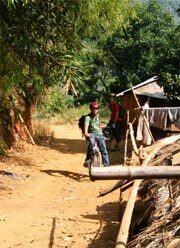 We pass by hill tribe villages and enjoy pine forests and the cool air at this higher altitude. First gradual descent along the top turns into a steep drop to the Mae Taeng Valley, all on hardly used forest road until we reach the bottom of the valley. 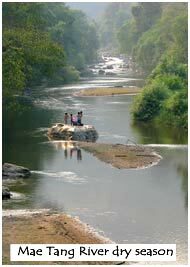 Then we ride on a small paved road through an astonishingly beautiful valley landscape, where we are greeted by elephants lingering by the river waiting to be fed. 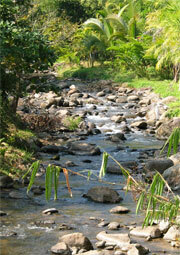 The experienced rider will enjoy this branch of the regular route down the south face of the valley through thick jungle on a very remote single track later following the water down into the farm land of the valley. Advanced riders and explorers will marvel at this remote ridge ride, these trails have never seen a bike before and who knows if we can find the exact same route again, these hunting and gathering trails branch and branch down and along the ridge as we descent in to the Mae Taman Valley. You want to be in good shape for this one . The views are magnificent. 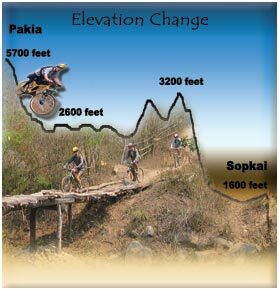 Only the strongest and the most fit will enjoy this very long and hot adventure down Pakia Mountain in to the upper Pakia Valley down to the Mae Taeng River. Putting all your skills and endurance to the test, we are pushing the envelope in exploration of Thailand's back country. This ride includes an awesome 4 wheel drive tour up to a 5700 foot mountain across from the famous Doi Chiang Dao, the last tooth of the Himalayas . 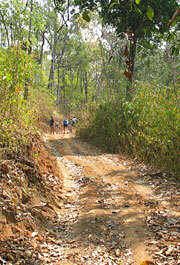 From here we ride straight down into the upper Mae Taeng Valley (2600 feet elevation) on hardly used fast dirt road. There is lots of steep downhill and plenty of beautiful views. 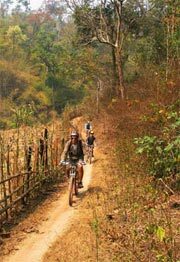 Once in the valley we experience single track winding up and down over numerous small hills through farm land and hill tribe villages . Finally we meet a dirt road again and work our way up over two medium size mountains. 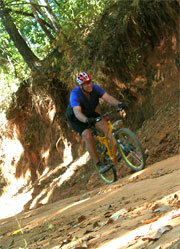 Then we get to enjoy another long winding down hill run, where again we can practice the art of downhill mountain biking. Once in the valley, we ride through rice fields and hill tribe villages to the Mae Taeng river at the small village of Sopkai where our driver awaits us. This is a very long day and beginners have to sit this one out. 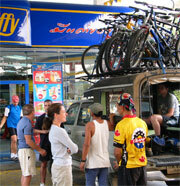 You should be in excellent shape and have ample biking experience. 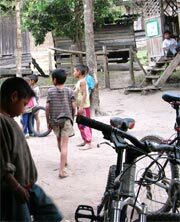 The natural beauty and hill tribe experience is astonishing, but comes with some physical sacrifice. 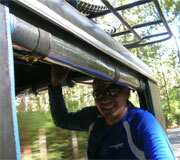 Elevation change : From 5700 feet (1750m) down to 2600 feet (800m) up to 3200 feet (990m) down to 1600 feet (500m).